This is how Joe Pulizzi makes the introduction to his book “Epic Content Marketing”. As counterintuitive as it may seem to start a business book this way, pretty quickly you understand the point he is trying to make as he gets into more detail about content marketing and its role within the customer purchase journey. Before we actually get into the main subject of this post, the difference between content marketing and social media, what exactly is this trendy concept that we keep calling ‘content marketing’? It seems to me that it has become a buzzword in the business world where executives keep giving directions to their subordinates to take advantage of content marketing in order to increase leads. But what exactly is it? In a nutshell, I believe that it would be an accurate description to say that it is the type of marketing that focuses on the customer rather than the product/service you are trying to sell. It is about satisfying the informational needs of your target customers or prospects. And let’s make one thing clear; although content marketing may seem like a new idea, it has existed since the beginning of time. It is about conveying important information to one another in a compelling and interesting way. Taken out of a business context, this is how we human beings interact with each other on a daily basis. We seek information, we look for solutions to our ongoing challenges and we want a reliable source that will provide us with the answers. You may have noticed that so far I haven’t mentioned anything about hard sells or call to actions and it is not because I forgot about them. Content marketing is not about pitching your products; it is about creating and nurturing a relationship with your target market through sharing relevant information that they are seeking out there in the cyber space (or whatever other medium you are using). How does that help you improve your business or increase your leads? Let me answer that with a well-known example. Most of us have heard of the agricultural giant John Deere & Company. The firm has been manufacturing agricultural equipment since the 1800s and has a very strong and loyal customer base around the world. 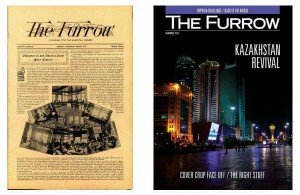 What you may not be aware of is that they have been using content marketing techniques since 1895, the year they launched The Furrow magazine. This publication was solely about providing information to farmers about how they can improve their businesses, maximize their profits and overcome the challenges they face. This way, John Deere started connecting with all these prospective customers in a well-defined segment, forging the association as the company that genuinely cares about the needs and success of the farmers. The magazine was only about sharing knowledge, without a single piece of promotional item in it. So when the time came for the farmers to buy new agricultural equipment, what was the company that they first thought of? John Deere. So as you can see, content marketing is not a quick-fix solution, but rather a long-term commitment for long lasting results. Now that we defined what content marketing is with a real-life example, let’s talk about how it differentiates from social media. At first sight, they may seem almost identical and there is definitely a lot of overlap between the two. Having said that, they are not interchangeable, but rather complimentary. Elaborating on Michael Brenner’s statement above, one of the main differentiators between social media and content marketing is the focus of the marketing activity. When you are working with a social media channel, your marketing activity is focused (and limited) to that particular channel. Say, if you are running a Twitter campaign, you are essentially operating within the confines of the Twitter ecosystem. Not to mention the chosen social platform’s own restrictions such as the character limit on Twitter. In content marketing, on the other hand, your operating platform can be whatever you want it to be; a website, a microsite, a landing page or even print media. In other words, you have more freedom and control over the distribution of your content. In my opinion, the main difference that sets social media and content marketing apart is the steps they focus on in the customer purchase journey* (or customer purchase funnel as some call it). Although you can design your content to serve various purposes, social media mainly revolves around creating awareness and customer retention. (Steps 1 and 5). The objective of content marketing is to help and guide the prospects through every step of this journey providing the relevant information that they look for in each stage. The focus is then to identify and understand the specific interests and expectations of a particular segment in a given step of their journey with your brand. Consumers in the awareness stage will likely be looking for very different information than those in the preference or purchase stage. What is crucial is to provide the right information to the right prospects, in the right place and in the right time. Of course, this is easier said than done. This is why we are witnessing the rise of marketing automation, a series of technologies that are designed to help marketers more effectively target consumers with relevant communications in each step of the purchase journey. In achieving the objectives of content marketing, the quality of the content you are publishing becomes critical. While there are opposing views on it, social media channels tend to be more about frequent and easily digestible quick updates as opposed to elaborate content. This contributes to a company’s online presence from a ‘search engine optimized content’ perspective. However, what’s more important is to understand the customer journey, identify the needs at each step and then provide keyword optimized, SEO friendly content that will not only boost your rankings, but will also deliver your prospects the exact information they are looking for. Although they have their differences, social media and content marketing are meant to work together as interconnected parts of your marketing system. They compliment each other rather than work in different directions. What is important is to understand each channel’s purpose, identify your customer journey process and take advantage of these resources to meet the consumers in the right place with the right information. It is going to be very exciting to see this all working together with marketing automation systems so synchronized that the information that your customers want will be there waiting for them before they even get to that step.